Sri City, July 1, 2016:- A ten member delegation of investors from Zhejiang province of China, headed by Mr. Hsieh Chih Tong, Chairman, Hangzhou Huatong Industries Inc., visited Sri City on Friday, as a part of their tour in India. Mr. Ravindra Sannareddy, Founder, Managing Director, Sri City extended a warm welcome, and briefed the delegates on the infrastructure and the unique features of Sri City. Following the briefing session, the delegates went round the campus and evinced keen interest in knowing more about Sri City and the industrial units that have come from different parts of the world. They visited the production plant of Pals Plush, a China company from Zhejiang province. Commenting on the visit Mr. Ravindra Sannareddy said, “We consider their visit very special. I am confident, this delegation will actively promote and strengthen the economic and business relations with China, particularly the Zhejiang province. Their views and suggestions will certainly be useful for us. 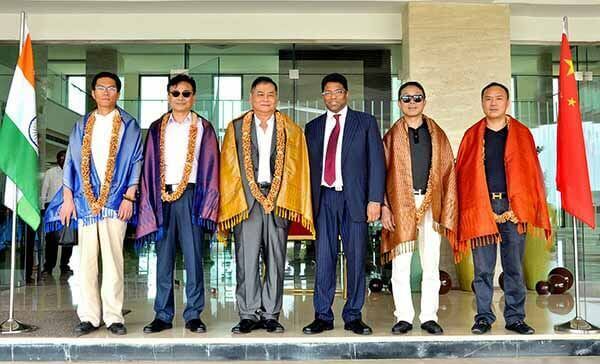 “Congratulating the Sri City management for developing such a mega industrial park, Mr. Hsieh Chih Tong said that it has been developed so beautifully with all world-class infrastructure. “It will definitely grow very fast,” he added. Other members in the delegation included Mr. Daren Ke, Chairman, Ningbo Guanhua Real Estate company, Mr. Bolin Feng, Charman, Zhejiang Xinhe Real Estate Development company, Mr. Shuihong Deng, Chairman, Hangzhou Hong Yi Oriental Institute of culture and Mr. Tianyi Zhou, Feng Shui Master. They are all some of the prominent companies in China in the infrastructure and realestate development sector. The purpose of their visit was to have a first hand information about the mega industrial park and explore the investment opportunities.